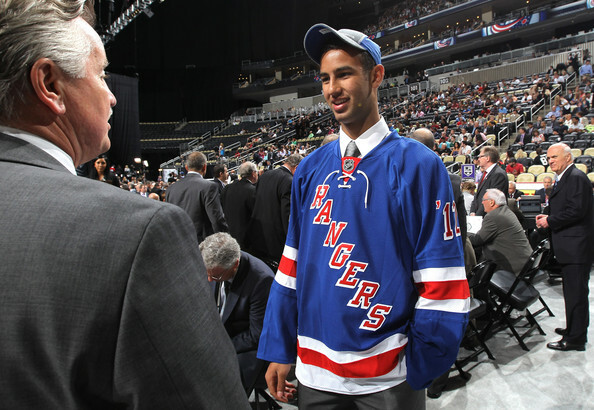 Gordie Clark, Glen Sather and the rest of the Ranger brass went to Pittsburgh and came away with four Future Blue. Last year Sather swapped his sixth rounder from this draft for Nashville's sixth rounder in that one and this time around he made two more moves with the Preds for picks. He got a third round pick for next year and a fifth round pick in this draft for this year's third rounder and a fifth next summer. Got all that? 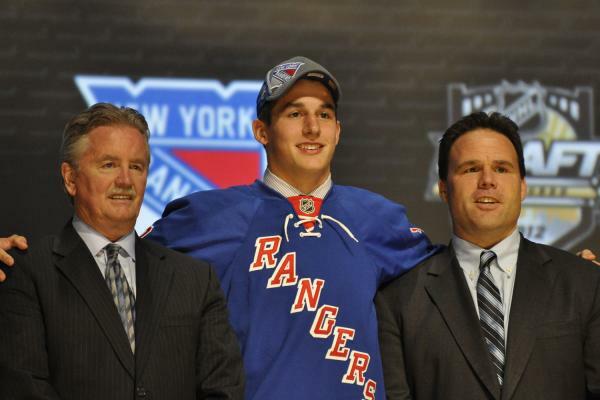 Brady Skjei - 1st round, 28th overall - You can never have enough defensemen, right? Especially ones that are favourably compared to Ryan McDonagh... Skjei is headed for Minnesota, where he will hopefully take the next step towards becoming a NHL defenseman. Keith Ballard, Paul Martin, Alex Goligoski, Erik Johnson, and Stu Bickel all played at Mariucci Arena since the millennium, showing how the Golden Gophers program can produce capable defenders. Cristoval “Boo” Nieves - 2nd round, 59th overall - As Matt mentioned in the preview, Boo dominated the draft combine so he should be able to handle Camp Tortorella (should the coach still be around when the kid comes out of Michigan). While it will be a while before be becomes a Ranger, Nieves will grace the Garden ice this year when he skates for the Wolverines against Cornell on November 24th. Red Berenson is a former Ranger and a brilliant coach who bequeathed us Ortmeyer and Hagelin so there is cause for faith. Matt, an avowed UofM fan, offered more: "The one knock on him is he's too much of a perimeter player at times, Red will work on that though. His hands are silky smooth, Rangers have not had a prospect with the stick-handling control that Boo possess." Calle Andersson - 4th round, 119th overall - Reports about Andersson read like he is a right-handed, Swedish version of Skjei - good skating, good size, good vision - just with more of an offensive edge. His dad was a fourth round Ranger pick himself but if Andersson he can follow another Calle's career path - former Cap Johansson - we'll have one workable defender in a few seasons. Thomas Spelling - 5th round, 142nd overall - The Danish winger did quite well playing against men in his home country's highest league last season. Spelling helped the Herning Blue Fox to the title with four goals and seven assists in the seven-game championship series against Odense, including a goal and two assists in a 4-0 Game 7 victory. While the natural scorer is from the same hometown as Peter Regin and Frans Nielsen (BOOO), he likely won't be facing them for a while - Spelling will spend this season helping Rogle in the club's return to the Elitserien. He is listed at 6'1, 165 so he definitely needs to bulk up if he is to make the leap over the pond eventually. Surprisingly Clark and company didn't select a single goaltender yet again, which is a bit of a cause for concern. Chad Johnson and Martin Biron are both UFAs and Cam Talbot is a RFO. That leaves Hank, Scott Stajcer and Jason Missiaen - not exactly organizational depth. Stajcer put up personal-best save percentage despite being a backup in the OHL and Missiaen did well as Greenville's starter (ECHL), but both of them are years away from the show. That position will have to be addressed by Sather soon - perhaps by signing camp-invitee Troy Grosenick - but that is a post for another time.